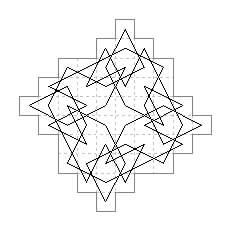 Oblique quaternary symmetry, can also be described as 90 degree rotatory symmetry or windmill symmetry. 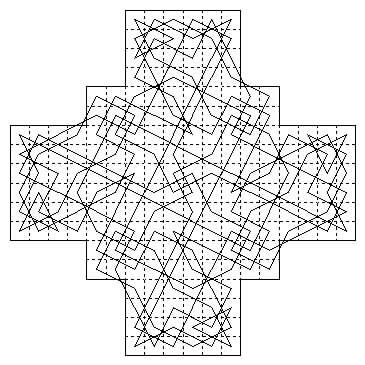 This type of symmetry is possible in knight's tours on square boards of side 4n + 2, that is squares 6×6, 10×10, 14×14, 18×18 and so on. For examples of quaternary tours on these boards see the separate pages dealing with these particular boards. Here we give examples of tours with this type of symmetry on "shaped boards", i.e. with a non-square outline and without holes. Oblique quaternary symmetry requires a board with a multiple of 4 cells, since each quarter of the tour has the same number of cells, m, connected by m − 1 moves within the quarter and four connecting moves. The board and the tour can be seen to be composed of four equal parts, of m cells and m moves respectively. A board without holes and composed of four congruent parts must be centred on a point where four cells meet. When chequered the corresponding cells in adjacent quarters will be of opposite colour. A knight journey between cells of opposite colour requires an odd number of knight moves, so on a board without holes m must be odd, say m = 2k + 1. So the number of cells in the board will be 4m = 8k + 4. This gives the series 12, 20, 28, ... The examples cover all sizes of boards from 20 to 196 cells in steps of 8 cells. Shaped boards can always be thought of as cut from a containing rectangle: in the case of oblique quaternary symmetry a containing square. If the containing square is of side 4n the number of cells omitted for oblique quaternary symmetry to be possible must be 4 + 8k (e.g. the four corners of the conventional 64-cell chessboard). In frames of side 4n+2 the number of cells omitted must be 8k (when k = 0 we get the squares 6×6, 10×10 etc mentioned above). Alternatively shaped boards can be thought of as square boards with other cells added round the edges. 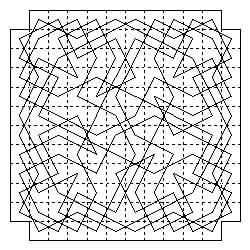 Within the 6×6 there are 8 oblique quaternary tours without holes covering 28 cells. 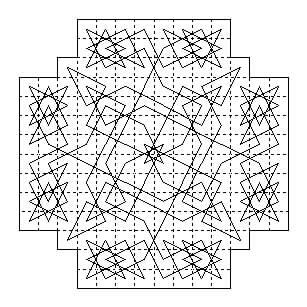 Oblique quaternary symmetry is possible on the 6×6 square without voids (see the separate pages on 6×6 tours). Here are some alternative 36-cell boards on which oblique quaternary symmetry is possible (Jelliss 2013). These boards can be regarded as a 4×4 with a pentomino added at each edge or corner. Readers may like to try other cases. 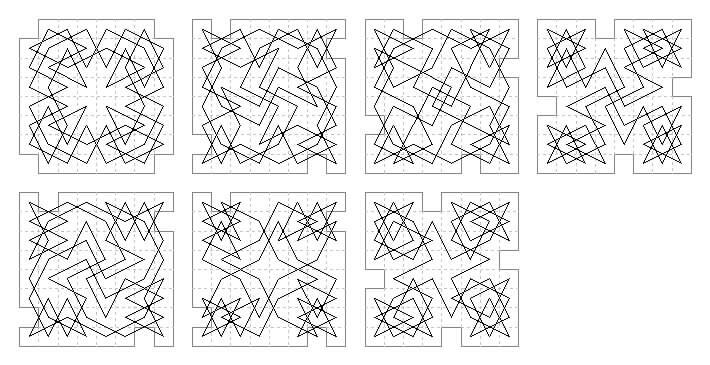 Three octonary board-shapes can be formed by adding two cells to each side of the 6×6, making 44 cells, and each of these can be toured in quaternary oblique symmetry. Three further tours on the first board added (Jelliss 24 May 2013) in which there are only four acute angles (as shown by the dots). The first board here used by S. Vatriquant (L'Echiquier 1928) can be thought of as a 6×6 with a T-tetromino added on each edge. 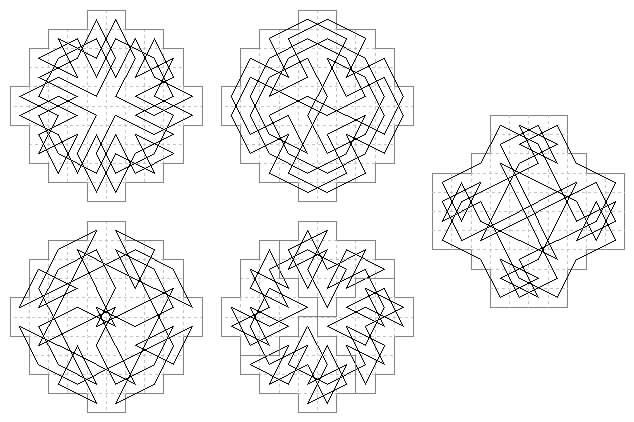 The three further examples (Jelliss 2013) add four cells along the edges to form boards with octonary symmetry. 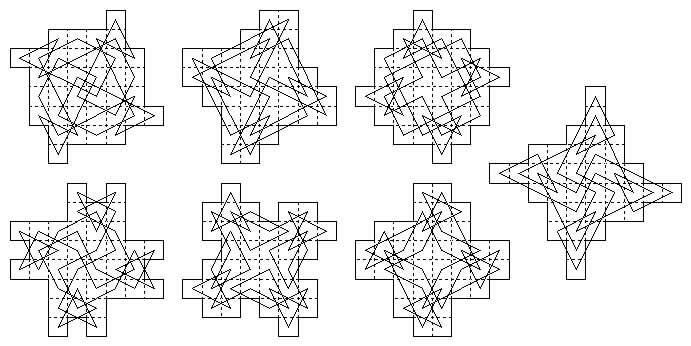 There are four geometrically distinct ways of removing four cells in 90° rotary symmetry from the edges of the 8×8 board. These four cases (and the five others with cells omitted internally) were all solved by G. L. Moore (1920) as in the first four shown here. These tours are single examples out of many possible. This subject has been independently rediscovered several times since Moore's work. We show three alternative solutions. The first of these is from Archibald Sharp in Linaludo 1925. The second is from W. H. Cozens in Fairy Chess Review (vol.8 No.3) 1952. 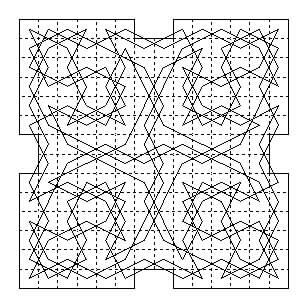 It is possible to form tours in which four maximal paths covering 15 cells of the 4×4 quarter-boards are joined together, as in my example (Jelliss 1985). 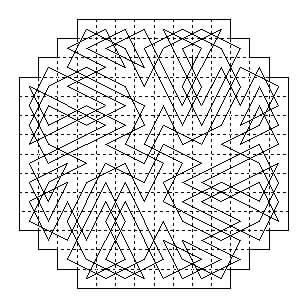 The near-circular board here was formed from the 8×8 chess board by removing corner cells and adding two at the centre of each side, as designed by Paul Byway for Troitzky Chess (published in Variant Chess 1997) where one of these tours (Jelliss 1997) was first published. The augmented cross-shaped board is also of 68 cells (Jelliss 2003). 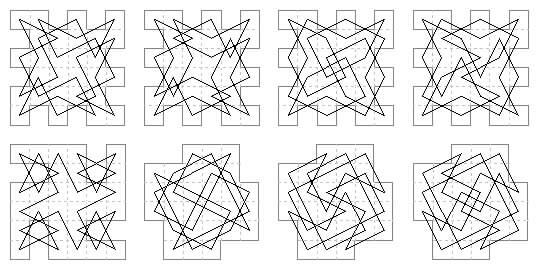 Quaternary symmetry is not posssible on the 80-cell Greek cross board, but becomes possible when four squares are added to make a type of celtic cross, as was pointed out by Ernest Bergholt in the magazine Queen 22 January 1916. Another of Murray's examples collected from Zürcher Illustrierte 25 November 1932. 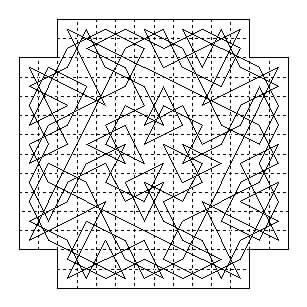 Quaternary symmetry is possible on the square board 10×10 (see the separate pages on 10×10 tours for numerous examples). The example here is just to show that there are other interesting 100-cell shapes besides squares (Jelliss 2003). 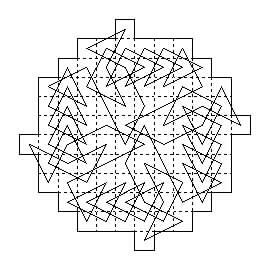 A tour from Denken und Raten 15 March 1931, recorded by Murray, formed by omitting 36 cells from the corners of the 12×12. 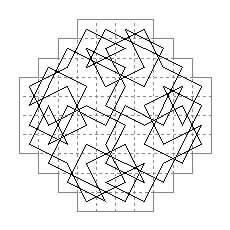 This tour is another with only four acute angles at the centre (compare the 44 cell examples). 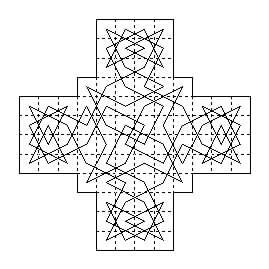 This example (Jelliss 2013) shows a complete Maltese Cross. These 124 examples are from Denken und Raten 25 January 1931 and 14 June 1931 They can be regarded as 12×12 minus four groups of five cells in the edges. The central pattern in my 156 quaternary example is adapted from two designs used by Edward Falkener (1892) in his 160-cell tours (his tours numbers 9 and 15). 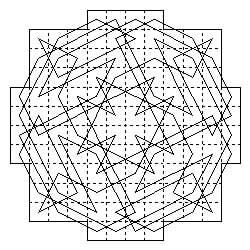 This example is after Falkener's (1892) near-symmetric design number 16 on a 160-cell Four-Handed Chess board (on which quaternary symmetry is impossible). 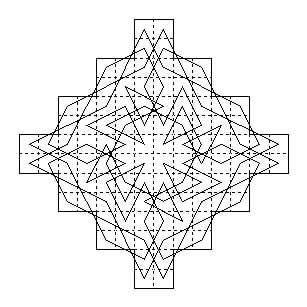 The four extra cells in the concave corners of the cross make quaternary symmetry possible. 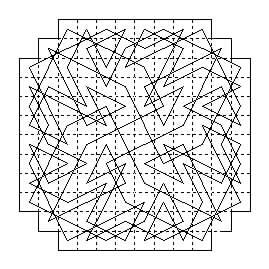 This example (Jelliss 1998) is 14×14 minus 24 (six at each corner). 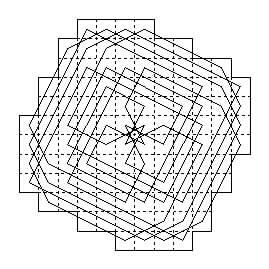 This example (Jelliss 1998) is 14×14 minus 16 (four at each corner). 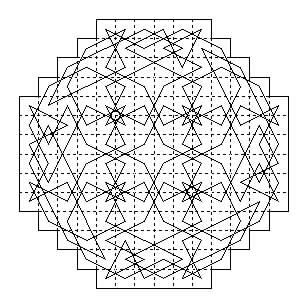 This example (Jelliss 1998) is 14×14 minus 8 (two in each edge). 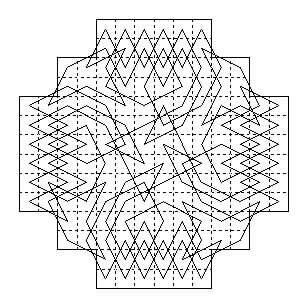 This shaped example (Jelliss 2013) includes six complete Greek Crosses delineated by knight moves, five of size 1 and one of size 7. I hope that, rather than simply reproduce the examples shown in this collection readers will be encouraged to construct their own tours, using pen or pencil on squared paper. Many more artistic and quirky patterns can be found. It can be an enjoyable recreation. Send me your best examples (preferably as monochromatic images). 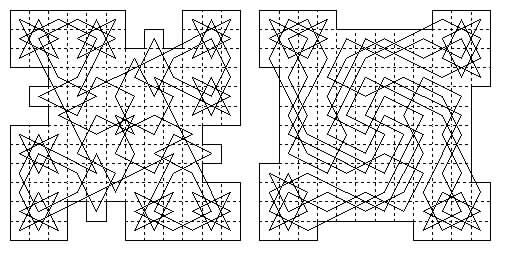 The diagrams shown here have all been drawn using the drawing facility in Lotus WordPro (with the grid setting showing dots at 0.1 inch separation). It is just a matter of joining up the dots! In the case of tours with quaternary symmetry it is only necessary to draw a quarter of the tour on the board to begin with. The rest of the diagram can then be completed by copying and rotating the first quarter.